ARTICLE NOTATION: Not a burial at Bachelors Grove cemetery. 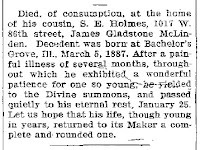 Died of consumption, at the home of his cousin, S.E. Holmes, 1017 W. 86th Street, James Gladstone McLinden. Decedent was born at Bachelor's Grove, Ill., March 5, 1887. After a painful illness of several months, throughout which he exhibited a wonderful patience for one so young, he yielded to the Divine summons, and passed quietly to his eternal rest, January 25. Let us hope that his life, though young in years, returned to his Maker a complete and rounded one.